The ARControl remote terminal unit (RTU) and the Burner Management System (BMS) have been certified for Class I Division 2 and Class I Division 1 respectively. All these certifications mean that our ARControl and BMS can operate in hazardous locations to extend the range of applications where these two devices can be utilized. Houston, TX, February 27, 2018 --(PR.com)-- Cimarron Energy is proud to announce that two of its products have received hazardous location certification from the CSA Group. The ARControl remote terminal unit (RTU) and the Burner Management System (BMS) have been certified for Class I Division 2 and Class I Division 1, respectively. Additionally, the BMS has been certified as a functionally safe device, in other words it was submitted through intensive testing and audits to verify that the operation of the device will be reliable and safe. All these certifications mean that their ARControl and BMS can operate in hazardous locations to extend the range of applications where these two devices can be utilized. 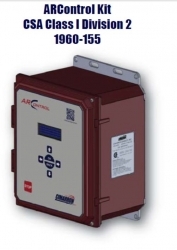 The Cimarron ARControl and BMS together provide a burner management solution that adapts to your wellsite. At its most basic, the ARControl and BMS in conjunction can monitor and ignite a pilot flame on flares, separators, treaters, burners, or combustors for added site safety. If the pilot flame goes out and cannot automatically be reestablished, the system can notify the customer’s automation system of the problem either through Modbus communications or its alarm output. Additionally, the ARControl and BMS can be paired with control valves, transducers, pressure switches and thermocouples for a complete burner management solution. The system additionally provides extensive data logging of the system’s multiple inputs and outputs to facilitate compliance of ever more stringent environmental requirements. Finally, Cimarron’s ARConfigurator Software provides an easy and intuitive interface to quickly configure and replicate the configuration of units, reducing the time and cost of deployment of the ARControl and BMS. CSA Group is a global provider of testing, inspection and certification services for products from a wide range of market sectors, and a leader in safety and environmental certification for Canada and the US. CSA certification mark appears on billions of products worldwide, and Cimarron is proud to display it on our ARControl and BMS. Cimarron is a leading manufacturer of engineered production, process, and environmental equipment and a long stand supplier with national market reach, Cimarron brings decades of engineering, design, manufacturing and service experience to its customers with product capabilities including: separation, treating, conditioning, and environmental compliance. As a process systems specialist, Cimarron ensures its customers prepare and transport oil and natural gas for end use, while treating and disposing of water and vapor by-products in a safe and environmental conscious manner. Click here to view the list of recent Press Releases from Cimarron Energy Inc.